ZacksTrade Pro is the flagship of our trading platforms. 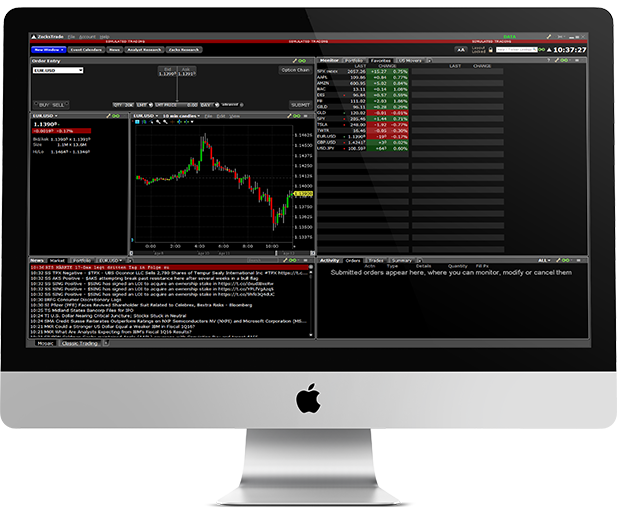 ZacksTrade Pro provides a comprehensive and efficient trading workspace that lets you put all of the essentials at your fingertips. Trade stocks, options, bonds and funds in over 19 countries, all from a single account. The best part is ZacksTrade Pro is free and available to all clients. Fully configure your own layout. ZacksTrade Pro is customizable and you can make your layout as simple or advanced as you like. Create multiple watch lists for any type of security. ZacksTrade Pro also lets you customize your data columns to the exact way you want to see it. View account balances, margin, funds available for trading, market value and portfolio data for all of your securities. See all of your open and filled orders. ZacksTrade Pro also allows you to modify or cancel your order rapidly from the Orders window. Trade options simply by clicking on the bid, or ask of an option chain. 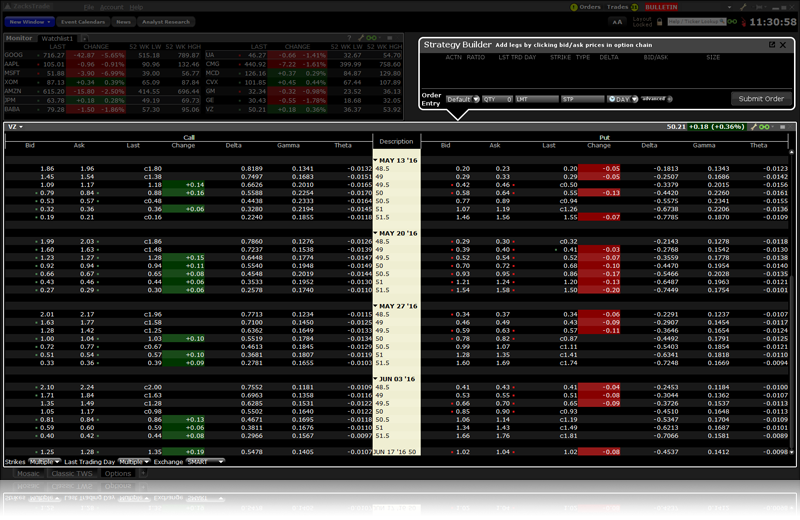 Use the Strategy Builder feature to create spread orders or option orders with multiple legs. Use the integrated suite of options tools such as Options Trader, Spread Trader, and Rollover Options to analyze and manage options orders from a single customizable screen. Create multiple flexible and scalable charts within your layout. 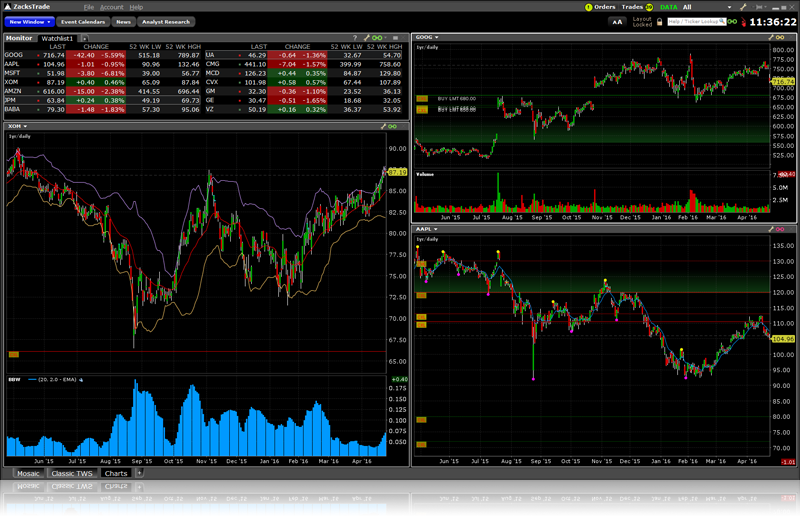 ZacksTrade Pro charts are fully customizable. Choose from over 120 technical indicators that are also configurable. ZacksTrade Pro also lets you trade right from the chart. Offers options probability without the complicated mathematics. Fully adjust based on your forecasts. Imports baskets of stock orders and executes them quickly within ZacksTrade Pro. Quickly and easily rebalance your entire portfolio based on your investment goals and risk tolerances. Screen stocks, options, mutual funds, bonds and more based on parameters you specify. Create and manage complex option orders with ease. Easily close or reverse any spread positions. Enter your price or volatility forecast for the underlying stock and view a list of potentially profitable strategies. A comprehensive toolkit of volatility tools providing a snapshot of past and future readings. Click your operating system below to download and install our state of the art platform. Once the software is installed, log in by double-clicking the newly installed ZacksTrade Pro icon on your desktop.